Aroldis Chapman’s first full season as a Yankee was up and down. Early season shoulder trouble and inconsistent performance meant Chapman finished with a 3.22 ERA (2.56 FIP) in 50.1 innings last year — those were his highest marks since 2011 — before he rebounded late and pitched well in October. The strong finish gave everyone hope we’d see vintage Chapman in 2018. Chapman was selected to his fifth career All-Star Game this year and he did finish strong in late September and the postseason, though the knee injury sabotaged his second half. Even when he was deemed healthy enough to pitch following the All-Star break, Chapman struggled. The injury was a real bummer. Time to dig into his season. Late last season Chapman attributed his strong finish and postseason to a grip change. He reportedly switched from his usual fastball grip, which was more like a cutter grip, to a true four-seam grip. The velocity and life returned, and Chapman was better able to locate the pitch as well. That success carried over into this season. Chapman went 26-for-27 in save chances in the first half — the Yankees came back to win following the lone blown save too — and was just overwhelming. Six runs and 33 baserunners in 40 innings with 68 strikeouts. He held opponents to a .126/.234/.207 batting line and never once in 41 first half appearances did Chapman allow more than one run. ?? Goodness. All-Star closer and the hardest throwing pitcher in baseball history against the reigning AL MVP with the game on the line? That’s as good as it gets right there, and Chapman completely overpowered Altuve. That game was in the middle of a stretch in which Chapman struck out 15 of 25 batters faced across six appearances. We first got wind of Chapman’s left knee issue in June. He threw a pitch during his June 8th save against the Mets, hobbled around a little bit, and trainer Steve Donohue came out to check on him. Chapman remained in the game and finished things off, then revealed he’d been pitching through left knee tendinitis for several weeks. Chapman continued to receive treatment and continued to pitch — he got another save the very next night — and there were no indications the knee was giving him trouble. In 14 appearances between that June 8th outing and the All-Star break, Chapman allowed four hits and five walks in 13.1 innings. He struck out 22. It would’ve been impossible to tell he was pitching hurt had he not limped a bit following a pitch during that June 8th game. It wasn’t until Chapman’s first appearance following the All-Star break that something was clearly wrong. He faced five batters on July 21st and went walk, single, walk, walk, hit-by-pitch. Nineteen pitches, three strikes. Chapman came in with a 7-3 lead and left with a 7-5 lead and the bases loaded and no outs. Chasen Shreve came in and managed to close out the game. Felt like a miracle. In his first nine appearances after the All-Star break Chapman walked eleven batters in seven innings, and the Yankees gave him as much rest as possible. Know how late-inning relievers will sometimes get into a game simply because they need work? Not Chapman in late-July and August. At one point he made only five appearances in 21 days, and three times he pitched with six days rest. On August 21st in Miami, Chapman entered with a one-run lead — it was his first appearance in six days — and had to exit the game after six pitches. The knee had become too painful. Chapman went for an MRI the next day and headed to the disabled list with what the Yankees called knee tendinitis. Chapman spent about a month on the disabled list. He exited the Marlins game on August 21st and his first game back was September 20th. That first outing was a disaster (three runs and two outs), but Chapman was nails the next four times out (3.2 IP, 0 H, 0 R, 2 BB, 8 K) as the Yankees eased him back into action as a middle reliever. He resumed ninth inning duties in the postseason and closed out the Wild Card Game and ALCS Game Two wins, and also threw a scoreless inning in the ALCS Game Four loss. The knee was no longer an issue. Ten times in his final 20 regular season appearances Chapman’s fastball averaged under 98 mph. He did that 16 times total in 298 appearances from 2013-17. Yeah. Chapman turns 31 in February and has a lot of innings on his arm, and Father Time remains undefeated. Every pitcher loses velocity with age, especially once they hit 30, and Chapman is no different. In this case though, there’s also an injury to consider. Chapman’s injury was to his left knee, his push off knee, and he may not have been able to push off properly and generate his trademark velocity. Or maybe he held back some in an effort to prevent further pain or damage to the knee. That’s something that can happen subconsciously. When you’re hurting, it’s only human nature to protect the injury. Slider usage is up — the fact Chapman increased his slider usage last year and again this year leads me to believe this has been in the works a while rather than be a spur of the moment thing in response to the knee and velocity loss — and wow look at those results. This season the MLB averages were 35.5% whiffs-per-swing and 43.9% grounders for sliders. Chapman was well above both marks. … dropped on them, well, it can lead to swings like that. The slider went from show-me pitch in the past to a legitimate weapon for Chapman this season. He threw it more in all situations. Behind in the count, ahead in the count, with two strikes to righties and lefties, whatever. 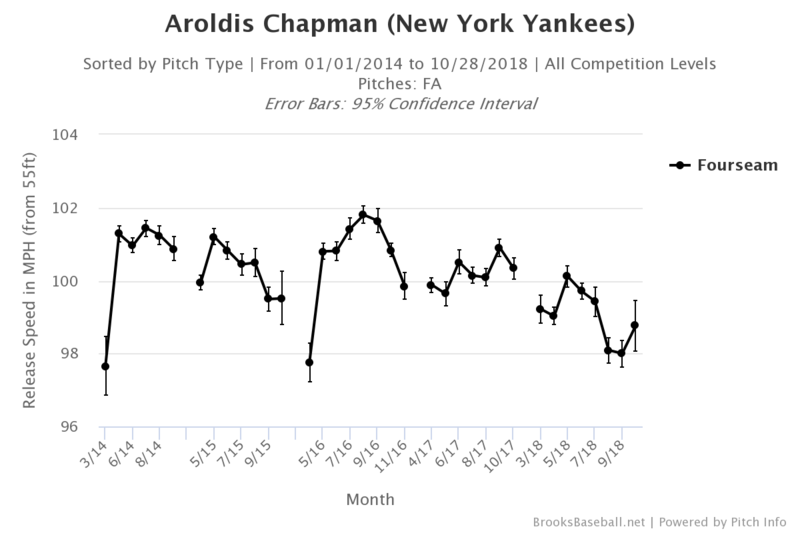 The Yankees and Chapman changed the scouting report a bit this season and that slider allowed him to remain (very) effective even while hobbled and with something less than his peak velocity. The thought that Aroldis Chapman, the guy who most stands out for his velocity in this era of big velocity, is losing velocity is kinda scary! At 102-105 mph, he’s untouchable. At 97-98 mph, he’s a bit more human. What happens in a year or two when he might be 95-97 mph? Eek. The fact Chapman successfully emphasized his slider this year and turned it into a weapon is encouraging to me. He’s made an adjustment and found a way to get outs (found a way to still dominate, really) even without being able to throw 105 mph by everyone. I was glad to see it. 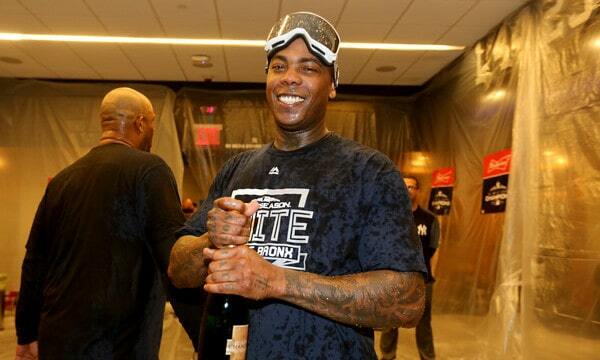 Next season is the third year on Chapman’s five-year contract and it’s a big one, because he can opt out next offseason. He’d walk away from two years and $34.4M. It is way, way, way too early to say whether Chapman will opt out. If the knee and everything else hold up next year and he dominates, my guess is he’d opt-out, even with the velocity loss. Chapman could wind up with more guaranteed money, even if he takes a pay cut annually. The opt-out isn’t really worth worrying about right now. It’s so far away and so much can happen between now and then. Brian Cashman recently told Brendan Kuty that an offseason of rest will “clean up” whatever’s wrong with Chapman’s knee, which is good, because avoiding surgery is always preferred. With a full no-trade clause and the Yankees valuing a deep bullpen, there is no reason to believe Chapman will be anything other than the team’s closer going into next season.